The 8 x 10 Super Heavy Duty Tarp from TarpUSA™ is 16 mil thick laminated polyethylene and have a weight 8 ounce per square yard. They are made from 1200 Denier with a 16x16 weave count. The cut size is 8 feet by 10 feet, while the finished measured size is roughly 3% to 5% smaller. These super heavy-duty tarps are ideal for for truck covers, roof covers, canopy tops, shelters, backyard ice skating rink liners, hay stack covers, boat covers and landfill coverings. Designed for continuous indoor/outdoor usage, these are the most durable and strongest poly tarp available industry-wide. 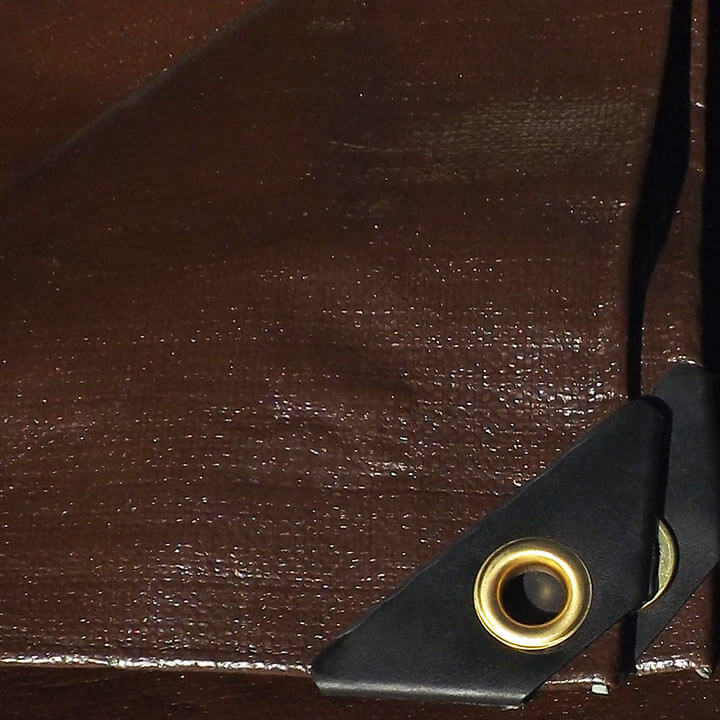 Our super heavy duty dark brown tarps are waterproof, mildew resistant, tear resistant and acid resistant. They are even flexible in Arctic-like conditions. The super heavy-duty tarps are laminated with brown polyethylene on both sides to completely block sunlight. It is UV treated for extended protection. They have folded edges that are double-stitched with cord reinforcement, and come with rustproof aluminum grommets installed about every 18 inches along each side and has reinforced corners for your convenience. For large quantities of 8 x 10 super heavy-duty tarps or bulk-shipping rates, please call us at (800) 352-6609.